Unique walkabout entertainment for your event, charming characters, Flying Officer Kite, Charlie Bubbles The Mad Hatter, Pirates, contemporary, traditional, Victorian, Edwardian, Viking! Performs across the UK and beyond. 2 Flying Officer Kite - A veteran pilot and bubble biplane! 3 Pirate Captain Perilous Pete- A floating pirate workshop! 4 Charlie Bubbles and his musical bubble workshops! 5 Pecan Petes’ Wandering Wagon of Western Skills Workshops! 6 Bertie the Balloon Bloke , livel Cockney banter with rubbish balloons at rubbish prices, “ Ere! what chu expect fer free!
" Flying Officer Kite and his Magnificent Flying Machine! " He's off on a dawn patrol , powered by bubbles and stirring flying music he needs a hand re-fueling! Fresh from The Festival of the Sky , Air Regatta and The Teddy Bears Picnic, it's a glorious interactive, almost flying act with a jolly moustachioed flying ace, who grew up on RAF stations around the world. "Smoke me a kipper I shall be home in time for tea!” What ho Sqiffy!” "Jolly good show! " Heralded by rousing music, he lands amongst the crowds and shows them all how to make the biggest bubbles in the land so he can take off again! This year accompanied by a flying bubble mobile! For details of availabilty please phone (44) 07875 826773 or email ahandfulofhats@gmail.com by clicking on this button. A glorious recreation of the Carribeans finest " Scourge of the Severn Seas! " Either as Meet and Greet for your guest or he's out and about to waylay likely lads and lasses to take the " Kings Shilling" and join his newest command that's safely on tow behind him. Piratical interactive fun and games, he takes no quarter but there be no slaughter. He'll test their skills. teach them sailors knots and give them pirate tips and tricks to keep them safe on the long journey ahead. See the Acts section for the Pirate Shows on offer. 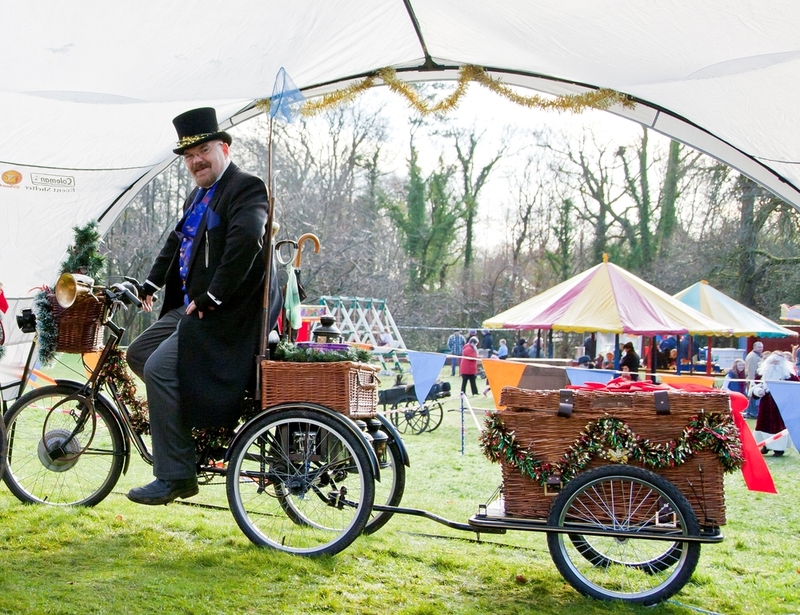 A vintage powered tricycle, with the perfect music to suit your event, whether it be modern, Victorian, 1930's Edwardian or Christmas tunes pour from brass trumpets and cornets and bubbles galore with an interactive bubble workshop and giant bubbles. With it's own cheeky Cockney Conductor, Charlie Bubbles, he'll lead the sing-a-longs and help the children and adults to make the best and biggest bubbles this side of the Bow Bells with his mobile bubble workshop. Wonderful as a wandering attraction for fetes and garden parties, a firm favourite in parades. Available themed as Victorian, Carnival, Edwardian and Circus with other themes available on request. 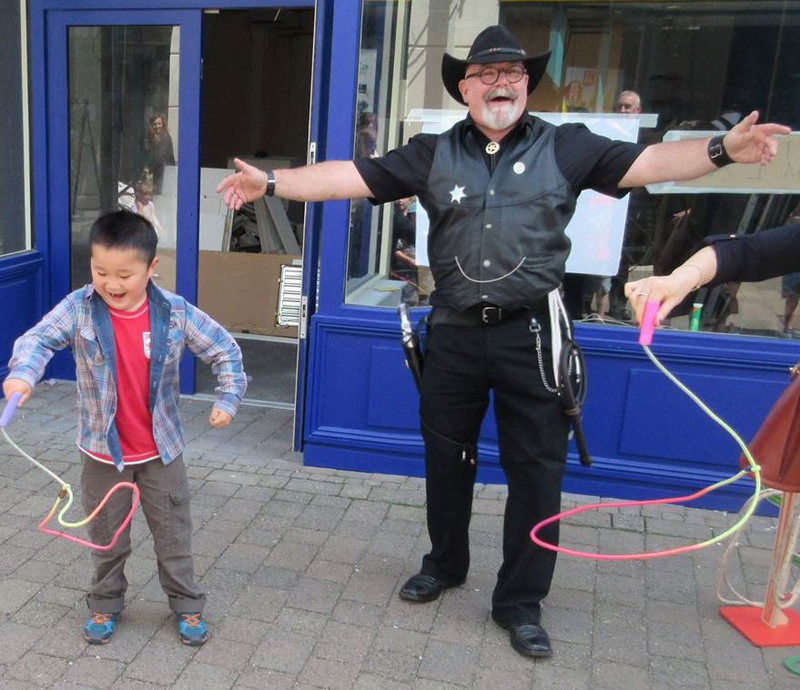 Charlie Bubbles also offers a " Bubbletastic Circus Show , please see the Acts page. A fantastic addition to our Grand Parade, we loved your interaction with the crowds, they loved you! The last surviving English cowboy in Wales! With his wandering wagon of western skills delights, he can be greeting your guests , teaching them how to crack a whip and spin a lasso and guaranteeing to put smiles on faces. Kingsman Media Launch for Fox Studios, Wild West Wednesday Lanelli Town Centre Fun Day , Magnificent Seven Media Launch Day for Sony Studios. Billy the Kid film etc etc. He can make anything your heart desires!" ............"as long as it's a dog"
Not the world’s best balloon modeller by any means, he’s not going to make Pikachus and Unicorns, No Siree bob! but a guaranteed crowd pleaser and excellent queue buster, with his bubbles and balloons on a vintage trike, whether it's "Swords for Pirates and Princesses" or how about Flowers for the Fanciful, Cats for the Cuddly, Teddy Bears for the Terrified and the famous "Flying Mice of Fear "
Each one made with cheery banter, sometimes even a touch of magic, a joke and a slap on the head to send them on their way ..... happy daze.. Phone 07875 826773 or click here to email us. features a unique Mobile circus workshop that takes all the fun of the circus to wherever your guests are gathering. A great fun circus character, whether it's for your Exhibition stand, Fun Day, Victorian Faire, Open Day, Christmas Market or Carnival Parade , packed with spinning plates, juggling clubs and balls, Victorian diablos, cups and balls, circus ribbons, tricks and fancies. For the full range of circus workshops available please see the Workshop section. Vintage entertainment in tweeds or blazer and boater! 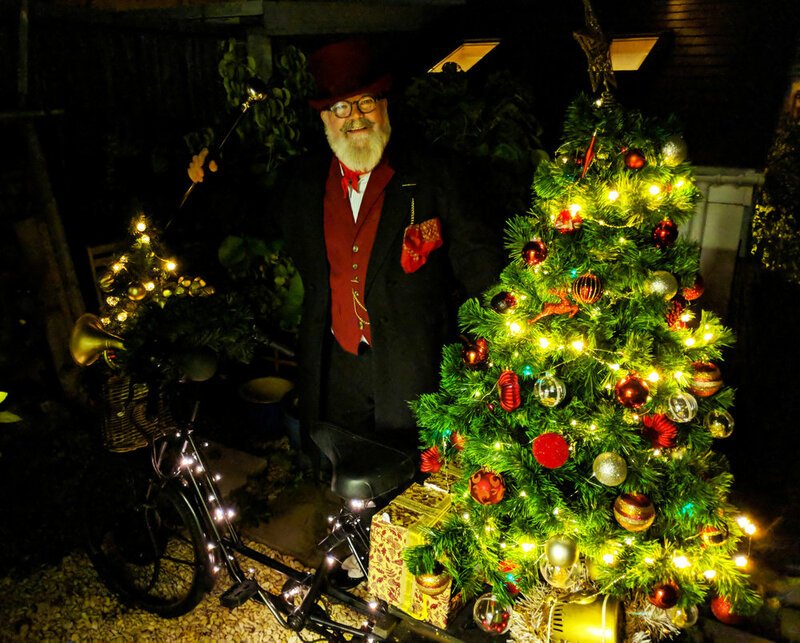 Accompanied by a selection of the musical top hits of the 20's and 30's and trails of bubbles wherever he went, this wandering with his bubble workshop was a great hit itself, a stilted banjo player are also available. It’s his younger brother Charlie and he’s coming out to play! He’s got these Christmas trees see, special price they are , all you got to do is answer some questions on his Christmas Quiz win some prizes, blow some bubbles and he might let you have one to take home…..
or more details and a video of him in action please see the Christmas section on the Shows and Acts page.